Tomatoes - and tomato plant problems - abound this time of year. And 2010 is turning out to be an especially vexing year for tomato growers here in California, due to our cool, wet spring. 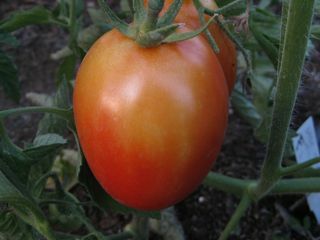 And now that the summer heat has returned, many tomato problems have returned to the forefront of gardeners' attention. Good sources of information to help you solve your tomato travails are the books from the University of California Division of Agriculture and Natural Resources, "Pests of the Garden and Small Farm" by Mary Louise Flint and "The California Master Gardener Handbook, " edited by Dennis Pittenger. These books take an integrated pest management approach to solving plant woes. Instead of first reaching for harsh chemical controls, the books suggest adopting cultural, physical, mechanical and less toxic methods to solve the problems. Some of these solutions border on common sense, such as not planting tomatoes in too much shade; ripping out and destroying problem plants; or, trapping snails or earwigs at night beneath boards, then destroying them the following morning. Symptoms: Tomato fruit turns light brown and leathery, on side exposed to sun. Solution: Don't prune leaf cover from plant. Keep plant vigorously growing to produce more leaves. SOLAR YELLOWING. 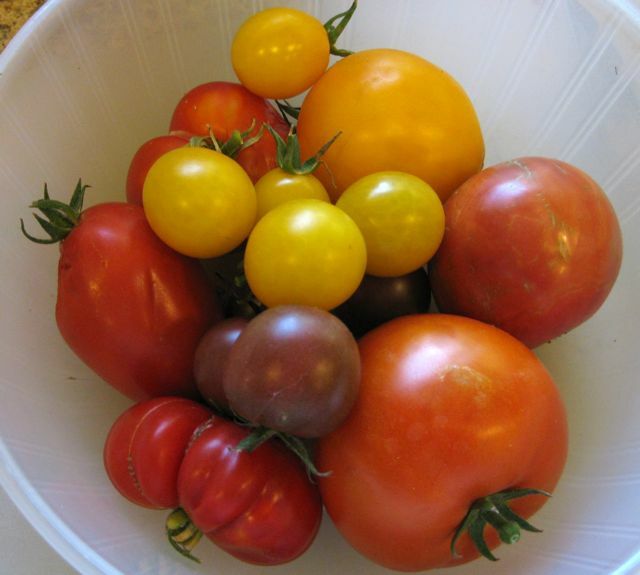 According to the UC Davis, Vegetable Research and Information Center , the reason for the yellow or yellow-orange color, rather than the normal red, is that the red pigment (lycopene) fails to form above 86 degrees (F). This phenomenon was first described by researchers in 1952 and was later confirmed by others. When lycopene fails to form, only carotenes remain for fruit color. An orangey-red color results. In production areas where temperatures do not exceed 85 degrees (F), much higher red color develops. 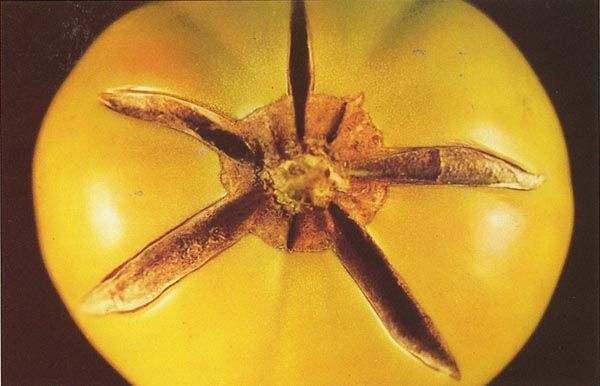 TOMATO FRUIT CRACKING. Radial cracking occurs during rainy periods, when rains follow long dry periods. Fruit exposed to the sun may also develop cracks. Maintain a uniform water supply through the use of drip irrigation or mulches. A full leaf canopy will also help protect fruit from the sun and reduce cracking. Symptoms: Tomato leaves eaten, areas of fruit eaten, black, pellet-like droppings on and below plant. Solution: Hand pick in evening or morning. 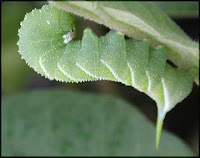 Use sprays that contain Bacillus thuringiensis, a less toxic microbial pesticide, to control young hornworms. Symptoms: Tomatoes are brown or black on the bottom end. Possible culprit: Blossom end rot. 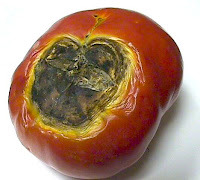 Due to a calcium imbalance, brought on by cycles of too much or too little water; other factors that may contribute to blossom end rot include improper soil pH (tomatoes prefer soil in a range of 6.0-7.0) and too much nitrogen fertilizer. Solution: Maintain even soil moisture. Avoid varieties most prone to it. Symptoms: Poor vigor, reduced yields, tomato leaves turn brown from the bottom up. Swellings on the roots. Possible culprit: Root knot nematodes. Solution: Plant resistant varieties, labeled "VFN". Rotate crops. Solarize soil. Add compost. Symptoms: Tomato plants grow slowly and wilt. Roots have water-soaked areas that turn brown and dry up. Possible culprit: Phytophthora root rot, common in overwatered clay soils. Solution: Avoid heavy watering for long periods. Water more frequently for shorter periods. Pull out and discard plant if problem persists. Symptoms: Tomato plants turn yellow on one side, spreads to rest of plant. Inside of main stem at base is dark red (stem on right) instead of a healthy ivory color (stem on left). Solution: Plant resistant varieties, labeled "VFN". Rotate crops. Solarize soil. Remove old plants. Symptoms: Older tomato leaves yellow, beginning between main veins. Internal stem is slightly tan colored, in small patches. 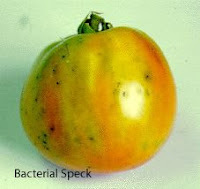 BACTERIAL SPECK: Hits during rain or overhead irrigation early in the season, during cool weather. Retards growth, reduces yields up to 25%, fruit spots, leaf spots. Leaf spots are near the edge of the leaf, dark brown with a yellow ring. Can spread throughout the leaf margin area. Common in cool coastal areas of CA. Solution: plant later in the season; avoid overhead watering. BLACK MOLD: More common in the late season, when rain or free water affects ripening fruit. Can be cosmetic, or cause deep lesions. Pick fruit as it ripens; keep fruit surrounded by leaf canopy. 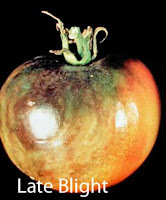 LATE BLIGHT: Develops during spring rain or overhead irrigation when air temperatures are near 70. The fungus overwinters on nearby areas where potatoes or tomatoes may have been planted. Purple-brown areas on leaves, turn to brown. Fruit may brown, but stays firm. Avoid sprinkler irrigation in cooler weather, especially if potatoes are nearby. Do not use sprinklers on bush-type tomatoes that have developed a dense canopy. Clean up and discard crops after harvest. Can be rain or sun related. Maintain a uniform water supply through the use of drip irrigation or mulches. A full leaf canopy will also help protect fruit from the sun and reduce cracking. 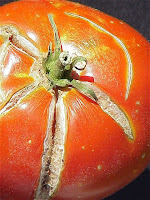 Other problems that may be attacking your tomatoes this summer include whiteflies (control with insecticidal soap), aphids (ditto), powdery mildew (give plants full sun, regular watering and avoid excess fertilizer; organic vegetable fertilizers are a better choice), tomato russet mites (don't plant tomatoes near petunias or potatoes) as well as cosmetic tomato problems such as cat facing (puckering of fruit caused by cool weather when plant bloomed) and concentric circles near the stem (due to sudden, rapid growth). Some heirloom varieties also just "crack" at the top. It's part of an heirloom's charm. The Marianna's Peace that I harvested last night had some cracking -- but not much. I wish you could have tasted it on that burger, Fred. I also had a lot of problems last year with Blossom End Rot in the test bed. I lost probably 70% of the production out of that bed to BER. But this year -- after I tilled it up again and amended it further -- I also worked in a box of cheap gardening lime. So far? BER is NOT a problem. "Tomato Pruning Tips: Pruning Tomato Plants Leads To Plumper Produce. Find Pruning Tips!" One can get somewhat confused! Great post Fred. I have one to add to your Other Problems. Stink bugs...I've got them horribly on my tomatoes. I pick them off every morning and evening and they are getting the best of me (and my tomatoes) Suggestions? I'll try just about anything! Katrina, I am Not sure why your comment didn't post to the blog, I hear that is happening to others, as well, on Blogger. What you are doing is the best control for stink bugs on tomato plants. In the morning, shake them into a bucket of soapy water, where they will drown. Some people use small hand vacuums on their squash plants for stink bugs. I have yellow to brown speckles on my tomatoe leaves this year. The leaves eventually turn yellow, then brown and schivel up and die. It appears to be speading to other tomatoes. A follow up to the speckled leaves, The stems also have black (dark brown) spots on them. the lower branches on my moms tomato plants are being chewed on. It looks like from some kind of animal. Some of the branches are chewed all the way through. Do you know what kind of animal would do this?